This specialized 60-ton trailer has a detachable gooseneck and features a drop side deck for equipment to ride at a lower overall height. This is a 3+1 axle configuration: the 4th axle can be removed or flipped onto the rear frame. 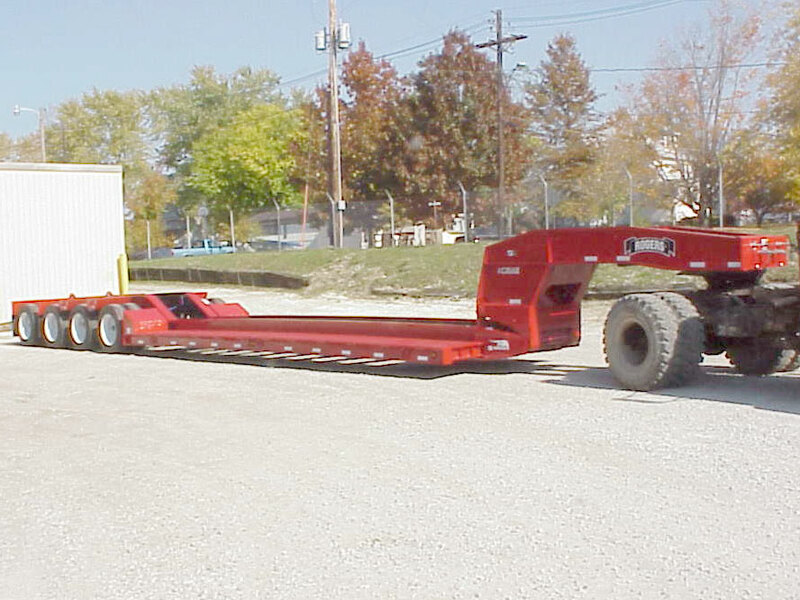 This "No Foot"® non-ground engaging gooseneck is equippped with hydraulic-operated trap doors. Modified bridge ramps allow a machine to load over the rear frame. Bearings for removable side brackets are installed to accomodate special sized brackets. The rear frame has 75,000 lb. capacity spring/walking beam suspension with a removable 4th axle controlled by an air valve.